Ferrari Enzo "CHARLIE'S ANGELS" STARS Edition Red 1/18 Scale by Hot Wheels Elite Edition, $499.99 at Modena Motors Inc. The Enzo Ferrari is a 12 cylinder mid-engine berlinetta named after the company’s founder, Enzo Ferrari. It was launched in 2002 as an expression of the latest Formula 1 technology and know-how with an acceleration from 0 to 100 km/h in 3.65 seconds and a top speed of over than 350 kilometer per hour. It was built in a limited edition of 400 pieces and represents a symbol of extreme performance. 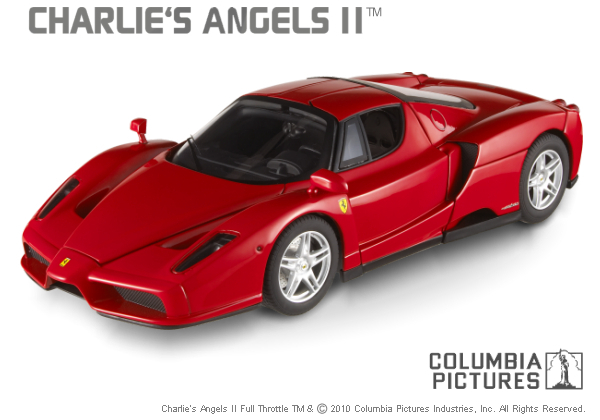 This exceptional model faithfully reproduces the real Enzo Ferrari driven by Demi Moore in the action-comedy movie Charlie’s Angels - Full Throttle, released in 2003 by Columbia / Sony Pictures. It features opening doors, trunk and hood to reveal a fully detailed engine and interiors; working wheels; moving steering wheel; seat belts; real rubber tires; and photo-etched parts.